This meal is from a Weight Watchers cookbook and it always surprises me how much Grant and Daniel love it. Not because it isn't good - it is - I just personally don't think it's amazing but they really enjoy it! I enjoy it because it's easy to make and doesn't take fancy ingredients. I do find that low-fat sausages can be a little dry and cooking them this way keeps them really moist and tender. Lightly coat a large lidded pan with low fat cooking spray and heat until sizzling. Add the sausage pieces and cook for 4-5 minutes until browned all over. Add the onions and stir fry for 3-4 minutes, then add the garlic and cook for a further minute. Add the juice and let it bubble for a minute before adding the lentils, stock and herbs. Bring to the boil, cover and simmer for 30 minutes until the lentils are soft and the sausages cooked through. Meanwhile, boil or steam the potatoes until soft. Drain, reserving a little of the liquid, and mash with the reserved liquid. 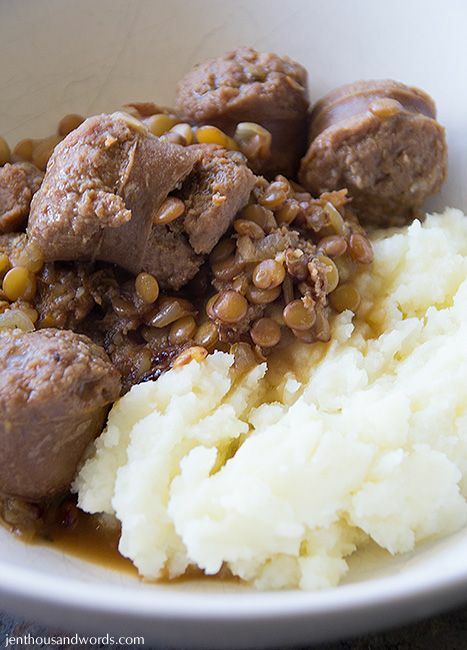 Season and serve with the sausage and lentils.